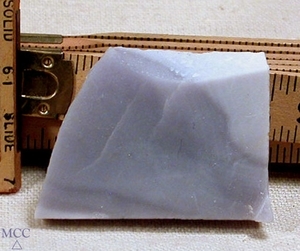 Sweet 3/8x 1 1/4x 2" handily cut slab of fluorite variety yttrium [rare earth element] shows off its' lavender color range and translucence. This rare fluorite shows a special, rounded [botryoidal] growth habit which has been nicely captured in the cutting. Harvested and cut in Colorado, keep this calming, protective, organizing piece with you but out of the sun to preserve its' unique colorations. It has a lovely suede-like feel, too.